With the tour for her latest book, "No Higher Honor: A Memoir of My Years in Washington,” still going strong, Dr. Condoleezza Rice made a promo stop over at Fox News to talk with Sean Hannity. During the conversation, the issue of race and how blacks preceive blacks affiliated with the Republican party came up. 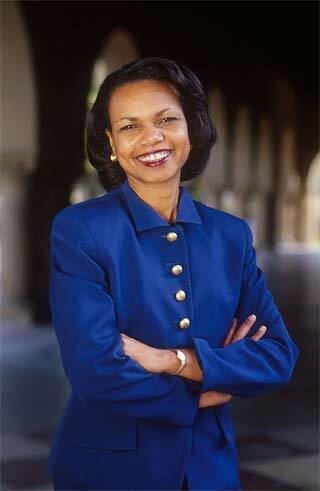 Dr. Rice was very methodical and precise with her responses. HANNITY: But there is a demographic issue that we cannot ignore, and that is in almost every election, African-Americans, about 90 percent, vote Democratic. And many close friends of mine that are conservative that are African-American are called the most horrific names. What do you make of that phenomena? You were called horrific names. Harry Belafonte comes to mind. RICE: Yes. And I always told everybody, I've been black all my life. You can't tell me what it means to be black, I don't need you to tell me what is it to be black. And so, I simply ignore it. And actually, I would say to people that think blacks have to think a particular way, you are the one who is actually prejudiced. If you were looking at somebody who was white, you would not say well, you have to think a particular way. And so if you look at somebody who is black and you say that about them, then check your own prejudice. HANNITY: But, you know, it was very strong language. Herman Cain, and I interviewed him, as he has ascended in the polls, I mean, against all odds, but he's had an incredible life. You have a pretty fascinating family background, so does he. I thought a great book I read was by Clarence Thomas "My Grandfather's Son." A must read by the way, all you students, a homework assignment. A great book. He grew up poor, the discipline of a grandfather brought him to be a Supreme Court justice. Both Clarence Thomas and Herman Cain have used a term "high-tech lynching," a powerful statement by both of them. And I wanted to get your opinion on it. RICE: You know, I actually don't like language that is too evocative. RICE: I just think the language is extremely evocative. Clarence Thomas is a friend of mine. He's a very good friend of mine. He was incredibly supportive of me the whole time that I was in government. And I think the world of him. I'm sorry that he went through what he went through. But I think we need to get past the language of race on both sides. My view is that I try very hard to give people the benefit of the doubt. And if I give them the benefit of the doubt, then I'm actually empowering myself because the minute that I give in to racial stereotype or to your high profile language about me, now I've lost, I've lost control. And so, I just don't engage in it. HANNITY: But you work for a very conservative president, you had very nice words to say about President Bush in your book during very consequential, historically consequential times. But yet other people, if they take a conservative position and they are African-American, why are they beaten up so badly and called these horrific names? You've seen it. You've heard it. RICE: Of course, I have. HANNITY: You've been a victim of it. RICE: Of course, I have. But as I said, Sean. RICE: No one can tell me how to be black. I know how to be black. I've been black all my life. And again, if you look at a black person and you say that person has to think in a particular way, I don't care if you are white or you are black and you say that, then you've got a prejudice. You can't see beyond race to give that person the dignity, the ability to think as they might. So I really don't engage in this. I simply say to people, you know, I'll think what I think and if you have a problem with that, it's your problem, not mine. Categories: Dr. Condoleezza Rice, What Does It mean to Be Black? Perhaps I need to read her book to gain some insight into her life. I do not get the impression that she has kicked the ladder away from others. Regarding this idea of "high tech lynching," I agree with her. The race card can be improperly played. Allegations were made towards Herman Cain and Clarence Thomas. the media is doing what it always does when there seems to be a scandal. In the end Clarence Thomas was confirmed to the Supreme Court and I do not think this will be the demise of Herman Cain's candidacy. I think we will start to see more black conservatives coming out. Why should their "blackness" be questioned? Content of their character right? We have lived this idea of linked fate. And we had to be united in order for our civil rights to be taken seriously. So when is it ok to separate from the pack and determine individually what we will ascribe to without the backlash? For the most part my comments were in response to the exchange between Dr. Rice and Sean Hannity. She said she did not agree with the language that they used and playing the race card as they did in their individual scandals. I agree with her on that. They went on to talk about the backlash black conservatives receive from other blacks which led to the latter part of my comment. I understood your comment. She may not be a proponent of affirmative action. I have had several conversations with others that are not fans of affirmative action even though they have benefitted from it. But they are still in favor of diversity and helping others excel. From that standpoint I say I do not get the impression of her that she has kicked the ladder away. I need to learn more about her to confirm my initial impressions. I imagine there is more behind why she feels the way she does. Now I would really be impressed if black people went Libertarian. The Democrats sent blacks to death in Vietnam, yet they still keep them voting Democratic. Dont get me started on the Republicans... So why do black folks not wise up? The two parties are flawed. Time to take away their power by doing your own thing. I forgot: plenty of blacks have died for expressing those sentiments.